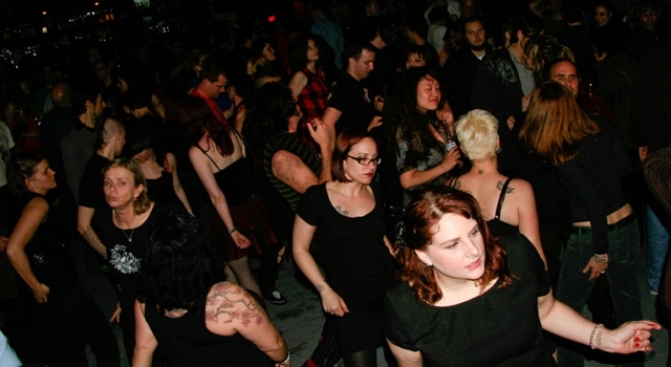 People dance during a recent show at the DNA Lounge in San Francisco. One long-running battle in the War On Fun seems to be coming to an end. First the Department of Alcoholic Beverage Control dropped a complaint against the Great American Music Hall and now it has reached a settlement with the DNA Lounge. Several San Francisco nightclubs have been waring with the ABC for allegedly violating terms of their license. However the news of the DNA Lounge's victory is not being celebrated by nightclubs. The settlement left the club, which was accused of being a "disorderly house injurious to the public welfare and morals," with a huge legal debt to pay off and almost a month long suspension. "I wouldn't call it good news, but I would certainly call it better news than what the news could have been," Jamie Zawinskiwrote on the DNA Lounge blog. "We will be closed from Monday, January 4th through Thursday, January 28th, and that will basically be the end of it." But there is still the matter of $125,000 of legal fees left to pay back and a month's worth of lost revenue. The DNA Lounge was able to raise $25,000 from supporters to fight the ABC challenge that started over two years ago, when the club applied to become an all-ages establishment. For several clubs across the City, the fight goes on as they fend off various alleged violations of ABC standards.